which cultivates various plants making use of climate of LAT.43°N . 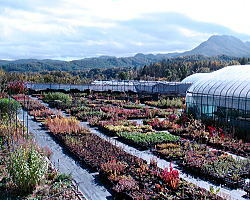 In this web-site, we are offering the plants including Japanese rare ones to overseas. 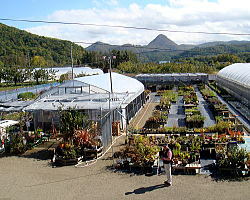 We are not wholesale nursery and there is no wholesale list. We will try to find them as much as we can. This is the photo of our nursery. A person who are squatting in front is Sachiyo who are in charge of overseas order. She will correspond with you by E-mail. We are not good at English and other foreign languages. If you find any mistakes on our web-site, please let us know. We have an oasis, a reservoir in the back of our nursery. We raise water lily, carps and other fishes in there. 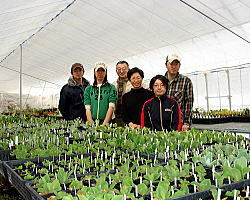 We had finished the plants sale for overseas this season. Thank you for many orders. 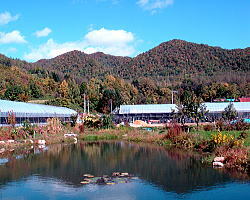 We will upload the new plants list on our web-site in September. Also, we will have ‘Summer Bulbs Sale’ from early summer. In this sale, we will ship summer resting bulbs. I hope you are interested in this. New seeds list will be uploaded in the end of July. I hope you are having nice spring season. Seed sale has ended this season. We will upload new seed list in July 2019. Early summer seeds, like Ranzania japonica and Erythronium japonicum, will be added to the list. We are shipping the order in order but now we need about 1 month for the shipping the new seed order in this season. We’ve updated new plants list for winter shipping! We have uploaded a new plants list for summer resting bulbs which will be shipped in the end of August to September. This list is for bulk buying. Some of them are more profitable than winter list. You can use the shopping cart. If you use the shopping cart, we will request postage and other charges separratelly. Also, mail order will be fine, of course. Please check the list and find the species you are looking for. The list for winter shiping plants will be expired and deleted on 8th March. We will upload the new seed list in June. Also, we will upload the list for summer resting bulbs in July. The new list for winter shipping plants will be uploaded in September. We will upload new seed list in July 2018. Because we can't speak foreign languages, the phone will be talken only in Japanese. To accept your order by E-mail is the best way. But if you don't have E-mail address, we can accept your order via Fax.